Can you believe that it is already mid-November? I still have to catch myself when I write month “11” on checks as I pay bills. And sooner rather than later, the holiday season will be upon us! In fact, I was in Ballard’s this week and Christmas music was playing over the PA system as I browsed the discounted mirrors selection. So, I’m linking up to some of my favorite holiday & fall inspired recipes that will get your mind swirling as you plan out your Thanksgiving menu in the coming weeks. On our table, we always, always dish up this simple & easy Slow Cooker Turkey Breast with an Orange & Rosemary Rub. The orange and rosemary is a nod to one of my favorite flavor combinations that Ina Garten uses on her poultry and it is a recipe that has evolved for us over these last 3-4 Thanksgiving celebrations. But, there is one thing I can say for it, it is absolutely delicious, super moist, and always so simple to make. You don’t even have to wait until a special occasion for this one! Put it on the night before and wake up to perfectly cooked turkey that you can keep on warm until ready to slice & serve. Seriously, hosting Thanksgiving doesn’t get any easier than that. Not a fan of turkey but still need a special protein on the family buffet? Give this Rosemary & Garlic Roast Beef a try! That just screams holiday to me! It’s on my Christmas menu for later this year; a smaller version of that, of course! I think my Dad and DatDat will love it- and a few days later, with any leftovers you might have, slices of this succulent beef would be delicious on a crusty roll with a smear of horseradish sauce. For appetizers, think something simple and fresh that can be served chilled or at room temperature with little to no fuss. This Creamy Herb Dip with fresh veggie dippers of your choice: carrots, cauliflower, bell peppers, cucumbers, etc. Something for everyone. 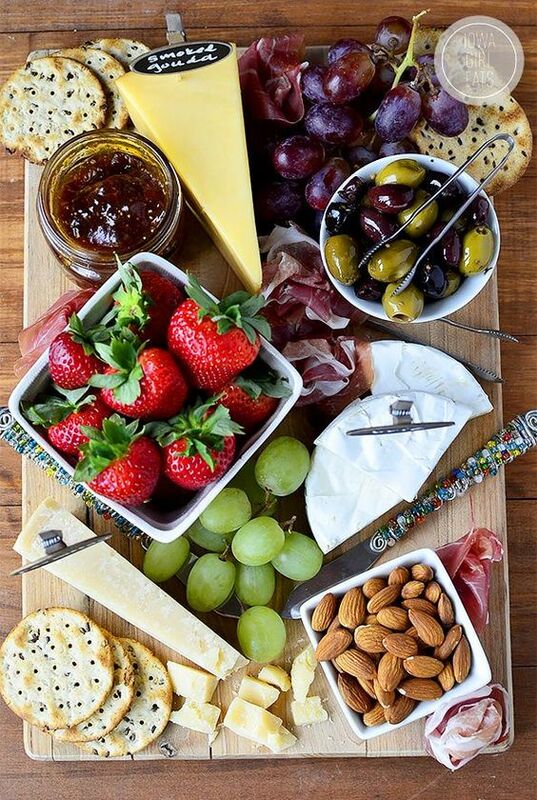 Or, set out a stunning Cheese Platter for your guests to nibble and nosh on until the bird arrives! There are really no rules, or right or wrong way to set a cheese platter, but a few successful guidelines to follow. Serve with crackers, bread, toast points, nuts, and fresh or dried fruit to enhance the overall flavor profile of the cheeses you select. Jams, jellies, chutneys, spreads, or honey are also great accompaniment to any cheese course. For more detailed information regarding organizing your holiday cheese platter, check out this blog post from Iowa Girl Eats. Very helpful! The key here is a no-cook appetizer that is crowd friendly and easy to prepare and serve. Alongside that delicious turkey and dressing (if you are from the South you never have stuffing on your Thanksgiving table), we need some delicious seasonal sides! I think it’s important to mix up you sides and not have too many items that compete for time in the oven. Some can be make ahead of time and stored in the fridge and reheated before the meal, others can be served chilled, or at room temperature, while others come straight from the oven to the table piping hot and perfect. One of those items that always comes out of the oven piping hot and perfect is Southern Sweet Potato Casserole, or Sweet Potato Souffle as it is known in my house. It’s a cross between vegetable side-dish that is masquerading as a dessert. 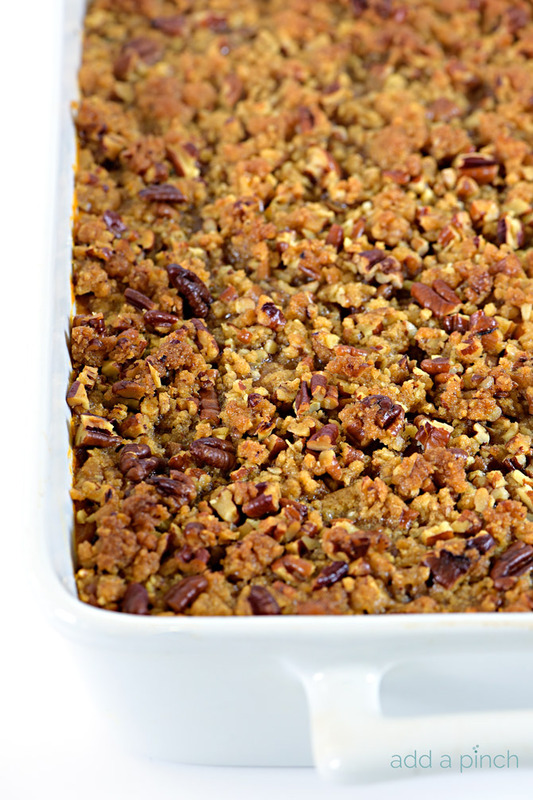 It’s sinful, sweet, and my ultimate comfort dish. There is debate on the toppings- of course- but, I am true to my Southern roots and here, we top ours with a brown sugar and pecan crumble, but the mini marshmallows topping is preferred by many as well. Make both and you be the judge! I am a big, big fan of green beans. They might be my 2nd favorite dish after the sweet potatoes. My mom has always ensured that a green bean dish is represented on our holiday table if only to satisfy me. I love them roasted, sauteed, steamed, or smothered in a delicious saucy, casserole. I like them any way they come. But, my absolute favorite way is in a skillet with lemon pepper and brown sugar. They are spicy, sweet, and tangy all in one bite! 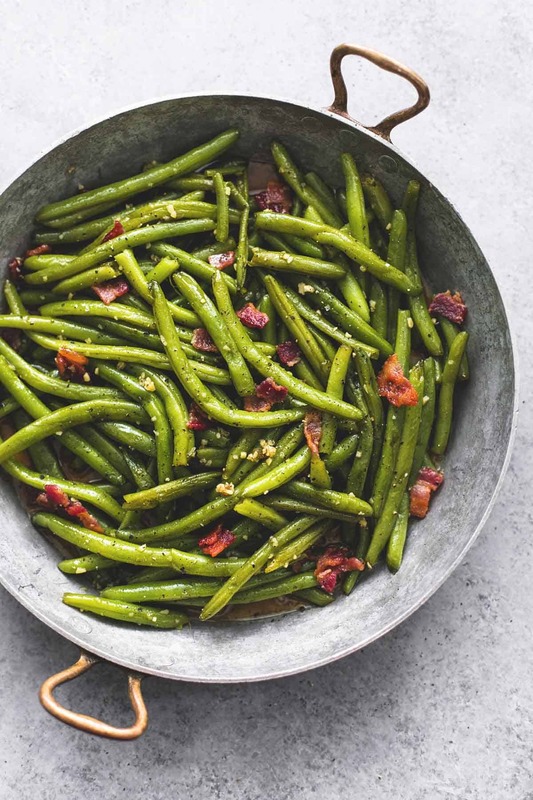 This is a recipe that is similar to Mom’s and has all the makings for a great tangy and sweet green beans side dish- Green Beans with Dijon, Brown Sugar, and Bacon. Slow Cooker Cranberry Sauce is a revelation! Make it the day ahead and then store for the big day! This one from McCormick is classic and very simple with just a handful of ingredients. This salad screams fall flavors to me. A Roasted Butternut Squash & Wild Rice Salad. 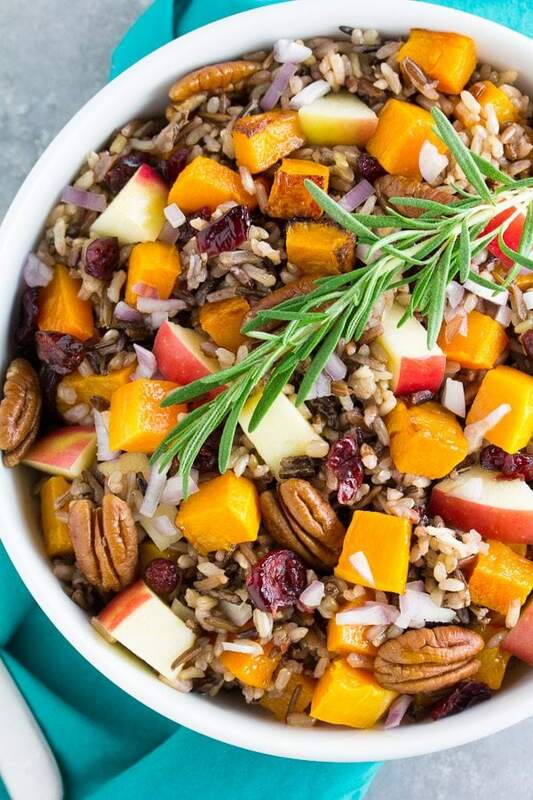 A nutty wild rice salad studded with roasted butternut squash, crisp and cool apples, and toasted pecans all tossed together in a bright apple cider vinaigrette. Seriously, the colors are perfect and I love, love, love anything with butternut squash. It is my absolutely favorite fall vegetable. Salad can be served warm, at room temperature, or chilled. Salads, I feel, are often overlooked and treated like the red-headed-stepchild of the Thanksgiving day banquet, but I feel a few can really hold their own and stand out! This salad is one of them. 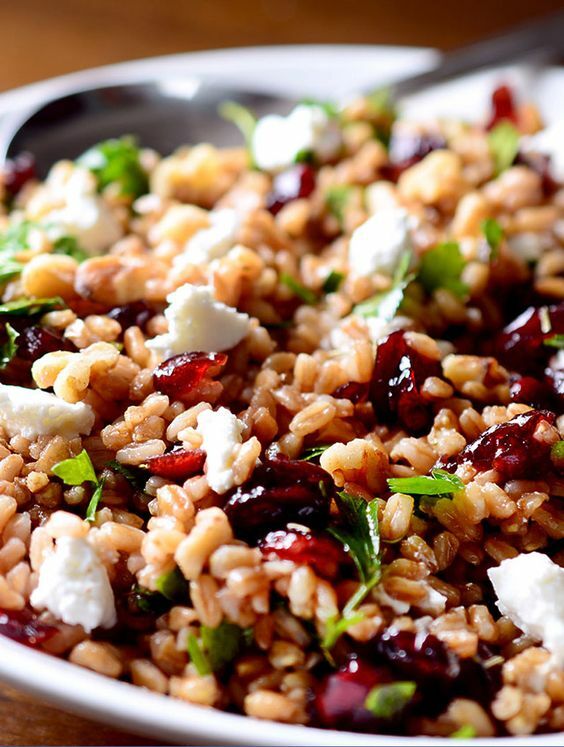 Farro, Cranberry, & Goat Cheese Salad is a delicious flavor combination and it will literally take you 10-15 minutes to pull it all together and the longer it sits in your fridge, the better and better it gets! If you are attending a Pot Luck, bring your own dish, to a Thanksgiving party… might I suggest that one? Easy to make and easy to transport too. Just allow it to come to room temperature before serving for best results. These dressed-up rolls are a cinch to make and take only seconds to pull together. You have enough to worry about on Thanksgiving… take a short cut when you can! Plus, they are absolutely perfect with your leftovers. I love making little turkey sliders with a slather of cranberry sauce. Mmmm, my mouth is literally watering right now. Good thing this meal is in my not-too-distant future. Think outside the box a bit and try something outside of the traditional Pumpkin or Sweet Potato pies, but still full of fall flavors. Upside Down Cranberry Apple Cake is delicious and a fool-proof Ina Garten recipe. Delicious moist butter cake piled high with crisp apples and tart cranberries dripping in a brown sugar glaze. It’s perfection. Carrot Cake Cupcakes are a perfect Thanksgiving day ending while you cheer on the Cowboys! They are a classic for a reason! This recipe has been made by generations of Dabbs & Hudson women in my household and no one can stop at just one slice! It’s spectacular! So, I hope that gives you a little holiday inspiration & gets your mind thinking of that all-important meal next week.